Concerning the Spiritual in Art is the title of a small book written in 1910 and published in 1911 by Wassily Kandinsky. The reason I bring it up is because I believe that it has important things to say about art that are just as relevant today as they were in 1910. When I say a small book, I mean it. The current copy I have just runs to sixty-five pages of rather large print. I first read this book as an undergraduate in the early 1960s. Those were the times when everyone was looking for the spiritual though mainly through the use of drugs or a superficial understanding of Eastern philosophy and/or religion. 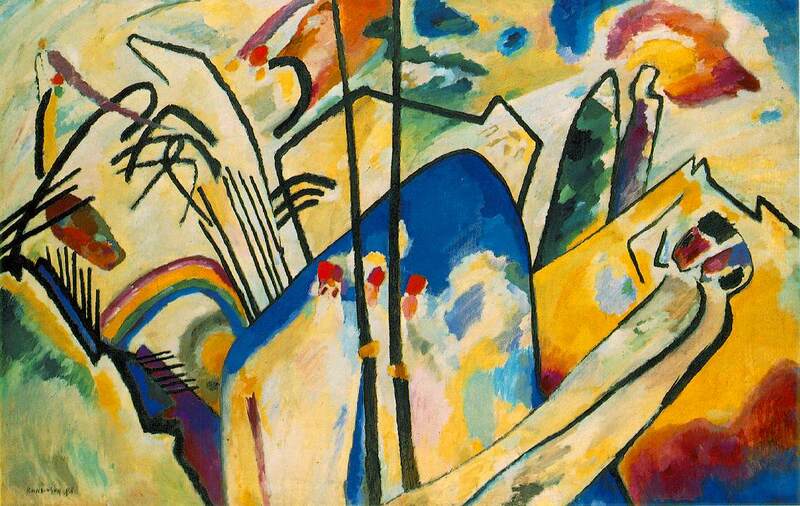 Kandinsky’s book turned out to be a text more on how to make art than a primer to instant bliss. His ideas of the spiritual were internal to him and turned out to make a lot of sense to me. When I first read the book, he was already he was already a favourite artist of mine. While I was in high school I had a framed large reproduction of one of his abstract paintings in my bedroom. I had lived in England during my first two years of high school and had seen his work in galleries there and in France. I fell in love with his work, and that of Paul Klee, an artist that he worked closely with. I still like their work even through most people think that I have a bias for realist art. That is just not true. I have a bias for good art which both Kandinsky and Klee produced in droves. I have been having ongoing discussions with friends, both artists and others, about how good art comes about. The subject of abstraction came up. This led back to Concerning the Spiritual in Art and a rereading the text. I bought my current copy a couple of years ago when I was writing a text on abstract art in New Brunswick and could not find a copy in my library. It was not easy buying a copy. It appeared to be out of print. I ended up by having a copy printed by Kessinger Publishing’s Rare Reprints. Believe it or not this service is not expensive. I think I paid around ten bucks for the book. I assume that many of you who are reading this article know who Kandinsky was and his importance to the history of art, but for those of you do not, let me re-cap. He was Russian painter and art theorist born in Moscow in 1866 and died in Neuilly-sur-Seine, France in 1944. He was the founder of the Blaue Reiter Group in 1911 (Named after his painting of the same name.). He was in the Armory Show in New York in 1913. He was a noted teacher at the Bauhaus both in Weimar and Dassau. He is credited to be one of the first totally abstract painters. His book of poetry Sounds was published the same year as Concerning The Spiritual in Art. There is much more, but needless to say; he was a player in the development of modern art. There is much more that can be said about this little book, but I recommend that you read it yourself. I think that you will discover that really new ideas are hard to come by. Someone else has likely, as Kandinsky, thought of them more than one hundred years ago. So give up on trying to be original and just do as best you can and remember that is what Jan van Eyck said about his art in the 1430s. ©Virgil Hammock, Sackville NB, Canada, 15 January 2019.